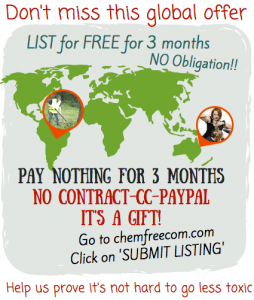 If you are new to the Chemical Free Community you can select the 3 months FREE option from the list of subscriptions. Click on SUBMIT LISTING under the logo top left of the home page. Identify appropriate subscription level according to how many listings you require (ref below) then find the ‘3mth FOC’ option in the list of subscriptions. You will not be required to connect Paypal or Credit Card and you are not obligated to stay with us at the end of the 3 months. You can only use the 3 Mth FOC subscription once. What happens after the 3 months? Well we'd love you to stay with us so have provided a few options. All 3 prices access all our services – where necessary priority will be given to those paying the higher monthly subscription. We are grateful for your support to help us continue to educate and promote businesses providing clean non-toxic alternatives! so there’s another 1 MONTH FREE when you renew after your 3 months free. If you have any questions or issues with your subscription or listing, please contact us. Are you a Farmer's market or a Not For Profit business? If you are either a market or an NFP organisation email us for details on your FREE LISTING. We accept both PayPal and Credit Card (via PayPal) payments. If you are not able to create a subscription using either of these process please contact us to discuss alternatives. We would hate to miss out on an opportunity to have you as a part of our community. Everyone is time poor these days so we are happy to help! Maybe you are not tech savvy, that’s OK too… the ChemFreeCom team can set up your supplier member account and create a listing for you based on your www and social media content. We can assign it under the 3 months FREE subscription for you to review and update. BASE – I’m a Startup, just getting going & keen to support this amazing initiative! BASE – My business is growing & I want to help you grow! BASE – I’m generous, love it & want to support the cause. If you are a Non-Profit/Not For Profit Community organisation your are eligible for our ‘Not For Profit’ Sponsorship. Are you a sports club, school, play center, community garden, events group etc..? Are you are chemical free/organic or transitioning to chemical free? We want people to know about you so you are FREE FOREVER on The Chemical Free Community directory. 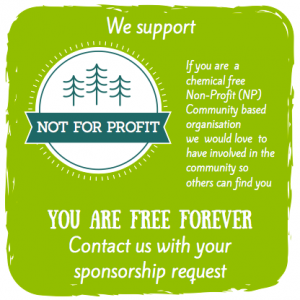 Please email us at info@chemfreecom.com with your request for a ‘Not For Profit’ membership and details about your NFP business. If approved we will send you a coupon code to discount the set-up fee listed on this membership. Once you have received the coupon code – click on the ‘SIGN UP’ button and follow the process to list your business, using the coupon on the checkout page when prompted.